One of the best aspects of our trip to Thailand was the amount of walking we did while we were there. 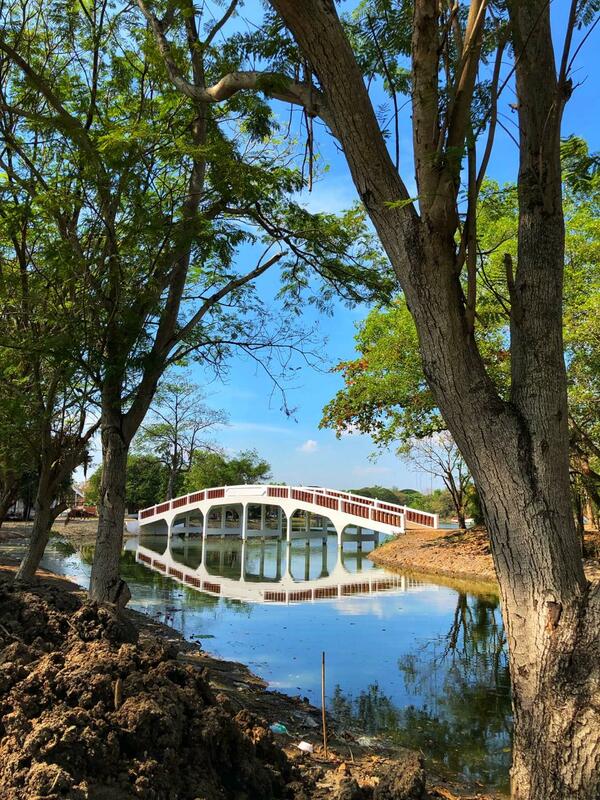 You have already read about our adventures on foot in Chiang Mai. Ayuthhaya was the same, only a couple of notches up. 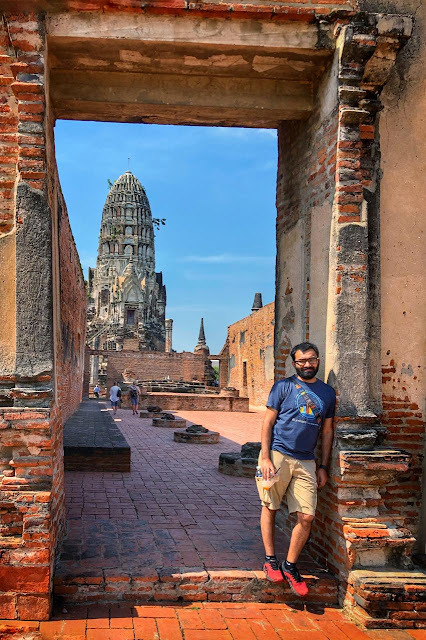 On our first day here, we walked about 10 km and about 7 of those in the afternoon, when we explored the Wats in the UNESCO World Heritage Site - the Heritage City of Ayuthhaya. And that afternoon walk is the topic of this blog post. As mentioned in the previous post, the manager of our homestay marked out all the important temples that we should visit. He had also advised us to buy a Temple Pass that covers the fee for 6 temples on the whole. This cost about 220 Bahts. Otherwise the ticket cost for each temple is about 50 Bahts. 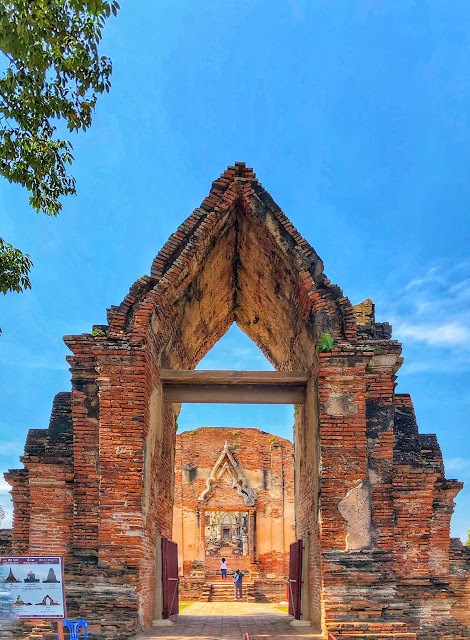 We bought a pass at the gate of the first temple we visited, Wat Ratburana, which like most of the other Wats on Ayuthhaya, is dilapidated. Most of the Stupas lean on one side and look ready to collapse. However, the temple is still beautiful. Also, this temple has several jujube trees that are home to an interesting variety of birds. and this inspired our itinerary for Day 4, but all that in another post. 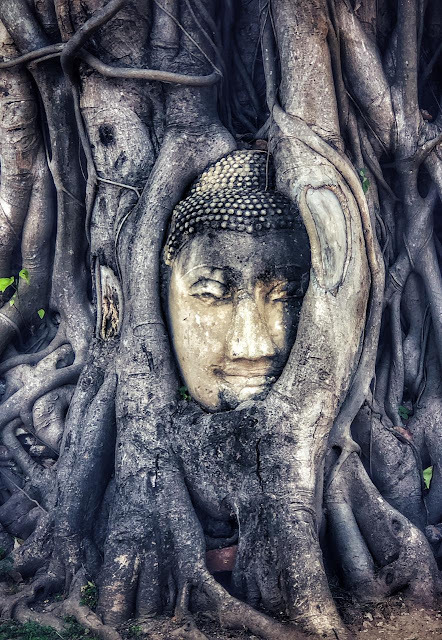 The next Wat we visited was the Wat Maha that, which is that famous temple where you can see the Buddha's head embedded in a Banyan tree. There are several Buddha statues here in this Wat - many whose heads have fallen off. It is said that one of these missing heads over the years got trapped in a Banyan tree growing around it and came up as the tree grew. It is indeed a beautiful sight to behold. But is smaller than what it appears to be in pictures. In fact, chances are that you will find a crowd around it getting their pictures clicked with it, otherwise you could easily miss it. Apart from the head, the temple is otherwise beautiful too. 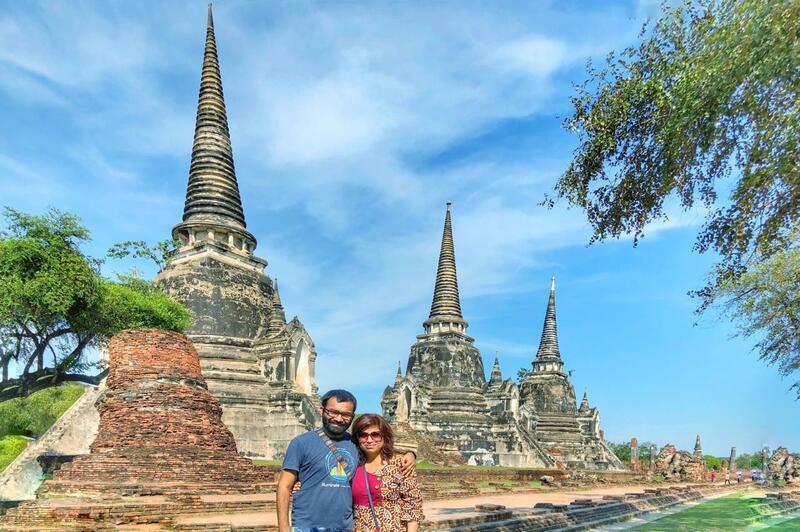 We spent around 20 minutes here and then moved on to our next destination - Wat Phra Ram. On our way, we came across a little temple known as Wat Nok and then a green area with a paved path. While we had chosen to walk, many tourists had rented bicycles and you could see them riding along this paved path. The path ultimately leads to a marshy water body (Bueng Phra Ram), on the banks of which, if you are lucky, you may see a couple of monitor lizards sunning themselves. We saw one swimming and it took us a while to figure out that it wasn't a huge snake or a crocodile. We reached Wat Phra Ram, which turned out to be as pretty as the other Wats we had seen. However, if you ask us today, I am sure, we will not be able to tell one Wat apart from the other. After a while, they all start merging into one. From Wat Phra Ram, we moved ahead to Wat Phra Mongkhon Bophit. But before going inside the temple, we decided to have some cold drink - iced tea again - as it was really hot. And by now I kind of knew that I was headed for a sunburn, despite the sunscreen. The Wat Phra Mongkhon Bophit was easy to remember, because it is a fairly new building with a rather large golden statue of Buddha in it. 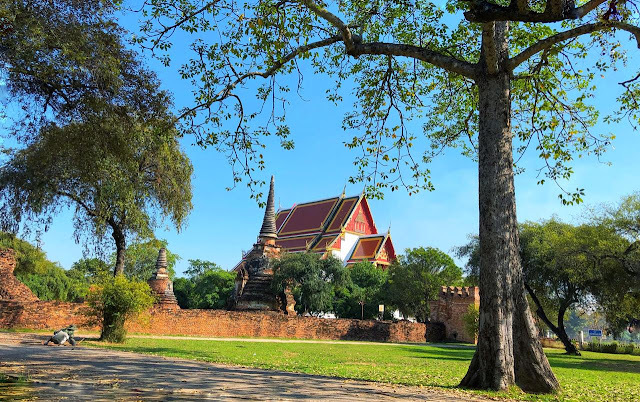 We then went on to explore the Wat Phra Si Sanphet, which stands out from the rest of the temples because of its three magnificent stupas that are extremely photogenic. They are some of the most photographed structures in Ayuthhaya. While we were exploring these temples, we were also aware of our stamina that was running out. But we still wanted to see the reclining Buddha temple and decided to walk towards that. I feel this was a mistake. We should have probably hired a tuk-tuk to the temple and back, but this realization came to us only once we were half way and there was no tuktuk to be found anywhere. 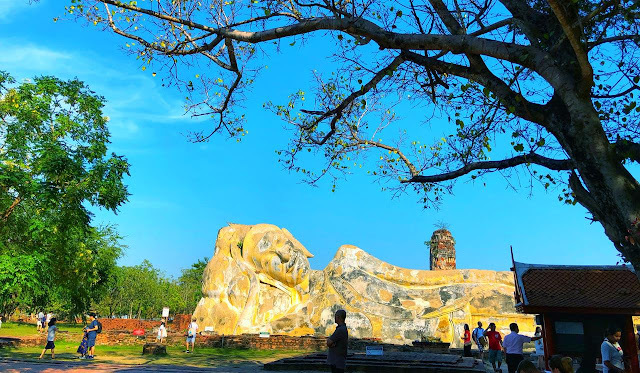 The reclining Buddha, however, was a delight. In fact, in my personal opinion, this is the most beautiful reclining Buddha in the whole of Thailand, including those made of Gold. The Buddha is also unique in the sense that all toes of the statues are of the same length and the arm on which the head rests is vertical, not slanting. The Buddha is often covered with a huge saffron cloth. The statue is fully exposed to the elements now, but earlier it was enclosed in a structure which later collapsed. If you are going to Ayuthhaya, this is one of the must-visit places. Anyhow, by now we were dead tired and also had to reach our hotel within one hour in order to catch our ride for the evening boat ride. Unfortunately, there were no free tuktuks around. We had no option but to start walking. We had walked half way to the hotel again when we were able to hail a tuktuk for a reasonable price. Seems like such a beautiful day. The colours of the temples dot the photos so well.